This tastes even better made in advance, so save time by making it the night before. 1. Finely slice the cabbage, discarding the core and any tough leaves. Melt the butter in a large pan over a medium heat, add the onion and cook for 5 minutes until soft, but not browned. 2. 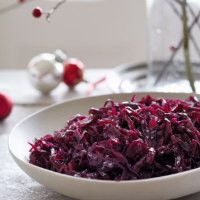 Stir in the spices, then add the cabbage, apple, red wine vinegar, sugar and 100ml cold water. Stir until thoroughly combined and the sugar has dissolved. Season well. 3. Bring to the boil, then cover tightly and simmer for about 1 hour, stirring occasionally, until the cabbage is very tender and the liquid has evaporated. Stir in the redcurrant jelly and allow to melt. If there's any left over, eat with cold meats, or freeze in an airtight container. When needed, thaw and reheat. This recipe was first published in Thu Nov 08 09:10:00 GMT 2012.